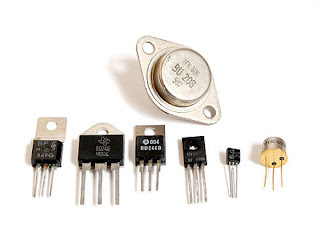 There are two varieties of ordinary transistors: the NPN and PNP. The NPN transistor consists of a type p semiconductor sandwiched between two n-type semiconductors. The PNP transistor consists of a type semiconductor n sandwiched between two p-type semiconductors. In both RSAC an electrode is attached to each underlying layer (layer of the semiconductor element). A small current Ib called "base current" flowing from B to E allows the passage of a current Ic from C to E.
This is the "current collector"
A low control from E to B allows passage of a current from E to C (power circuit).